Germany lifted the Confederations Cup trophy thanks to a 1-0 win over Chile in the final on Sunday. 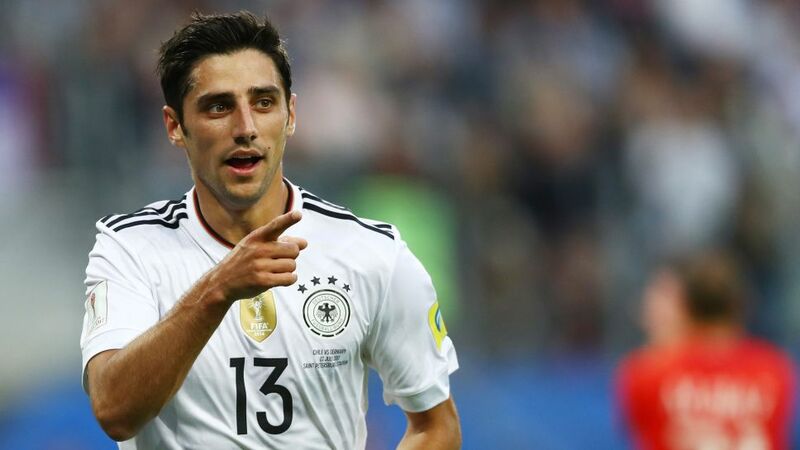 Borussia Mönchengladbach forward Lars Stindl grabbed the only goal of the game as Germany came out on top in a hard-fought final in St. Petersburg. Arturo Vidal and Charles Aranguiz both started for Chile, but ultimately La Roja were unable to find a way through a resolute Germany defence. Leverkusen forward Javier 'Chicharito' Hernandez started for Mexico and set up the opener - an own goal by Portugal - but El Tri conceded a late equaliser in stoppage time and let in another in extra-time as the Iberians fought their way back from behind to take the bronze medal. Read: Take a look at five of the Bundesliga's biggest stars on show in Russia this summer. Bayer Leverkusen striker Javier 'Chicharito' Hernandez headed in on the stroke of half-time as Mexico twice came from behind to draw with the UEFA EURO 2016 winners in Kazan. Bayern Munich's Arturo Vidal was named Man of the Match after his 81st-minute header secured a hard-fought victory for Chile. Former Hoffenheim striker Eduardo Vargas completed the scoring in additional time. The world champions kicked off their Confederations Cup campaign with an entertaining win over Australia. Gladbach's Lars Stindl and Schalke's Leon Goretzka were among the scorers in Sochi. Hertha Berlin's Mathew Leckie played the full 90 minutes for the Socceroos. Borussia Dortmund's Raphael Guerreiro provided the assist for the only goal of the game as the reigning European champions defeated tournament hosts Russia. The 23-year-old's pinpoint cross from the left set up Cristiano Ronaldo to head home, but Guerreiro was later substituted off with a suspected ankle fracture. Eintracht Frankfurt duo Marco Fabian and Carlos Salcedo both started for Mexico, who were forced to come from behind against a dogged New Zealand side. Fabian grabbed the assist for El Tri's equaliser, but the evening did not end well for Sacledo, who was stretchered off in the first half after falling awkwardly on his shoulder. Mexico go joint-top of Group B with Portugal, level on four points. Hertha Berlin's Mathew Leckie went the distance as Australia came from behind to draw with Cameroon in Saint Petersburg. Each with a point after two matches, the Socceroos face Chile in their final group game, while Cameroon take on Germany. Top spot is still up for grabs after Germany came from behind to draw with Chile in Kazan. Bayern Munich's Arturo Vidal set up Alexis Sanchez for an early opener, but the world champions were level before the break thanks to Borussia Mönchengladbach forward Lars Stindl's second goal in as many games. Bayer Leverkusen forward Javier 'Chicharito' Hernandez played from start to finish as El Tri booked their place in the semi-finals of the Confederations Cup with a 2-1 triumph in Kazan. Frankfurt's Marco Fabian was an unused substituted throughout, with Mexico finishing in second place in Group A on goal difference. Dortmund's Raphael Guerreiro may have played no part due to injury, but his team-mates helped Portugal top the Group A standings with a comfortable win over Oceania representatives New Zealand. The South Americans fought back from a goal down to gain a point the point that sets up a semi-final meeting with Germany. Bayern midfielder Arturo Vidal played 90 minutes while Charles Aranguiz of Leverkusen made way for goalscorer Martin Rodriguez at the break. Hertha's Mathew Leckie won his 43rd cap for the Socceroos, who exit the tournament. A brace from RB Leipzig's Timo Werner - his first goals in a senior international for Germany - followed Hoffenheim star Kerem Demirbay's maiden strike for Die Mannschaft, who advanced to the semi-finals as section winners thanks to this victory against the ten-men of ousted Cameroon. Schalke midfielder Leon Goretzka scored twice inside the opening ten minutes as Germany breezed into the Confederations Cup final. RB Leipzig striker Timo Werner added a third, before Eintracht Frankfurt's Marco Fabian pulled one back for Mexico with a stunning free-kick. Amin Younes restored the world champions' three-goal lead in time added on. Bayern's Arturo Vidal and Leverkusen's Charles Aranguiz both played from start to finish as Chile went to extra time and penalties against reigning European champions Portugal. Vidal struck the post with a fierce drive from distance seconds before the final whistle, but confidently stepped up to dispatch his side's first penalty in the eventual shootout. Aranguiz also netted his spot-kick to seal a place in Sunday's final. ALL NEW: Can you name these all-time Bundesliga records and statistics? Take part in our quiz below!